Osteopathy can help with fertility, pregnancy, preparation for labour and after-birth recovery. 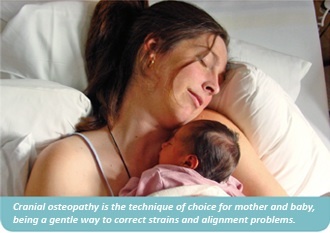 Cranial osteopathy is the technique of choice for mother and baby, being a gentle way to correct strains and alignment problems. Sometimes the body has trouble falling pregnant or carrying to full term. Osteopaths can work alongside your midwife and other obstetric services to support you during this time. Your fertility is dependant on many factors including your hormonal system, immune system, and mechanical factors in your body. Infertility can be associated with endometriosis, polycystic ovary syndrome, ovulation problems, or blockages in the fallopian tube. As osteopaths we can have a positive effect on the hormonal system, identify whether your pelvis is well aligned and functioning correctly and help improve circulation and fluid dynamics. We can also offer advice on diet, supplements and physical factors that may help you to fall pregnant and to have a healthy pregnancy. Pregnancy is a wonderful experience but it can sometimes be associated with a range of aches and pains. Major physical and hormonal changes are occurring rapidly, and the mother's body and posture must adapt to the new distribution of weight that comes with the growing fetus. As the uterus expands the organs in the pelvis and abdomen become displaced, sometimes causing breathing problems, heartburn, morning sickness and reflux. Existing problems in the lower back or pelvis and associated postural changes may make it difficult for the body to adapt and can result in back, neck or pelvic pain, sciatica, headaches, aching legs and fatigue, and fluid retention. Osteopaths can help to reduce pain and discomfort during this time. We can ensure your body is aligned, balanced and mobile so that there is enough space for the growing fetus to align naturally with your own tissues and fluids. Correctly identifying areas that have tissue tension, joint restrictions and fluid congestion and promoting drainage and a good circulation to these areas can help alleviate these conditions ensuring a happy healthy pregnancy and an easier labour. Osteopathy can help with the recovery process after birth. Muscles, joints and ligaments in the body have endured forces that may cause them to become strained and out of place. Your body needs to recover so that you can really enjoy and bond in those first precious weeks and months of motherhood. Doing everyday tasks such as nursing, lifting baby and car seats, bending over cots and carrying baby can put additional strain on the body. If these stresses are not treated then conditions such as backache, headaches, period problems, constipation, mastitis, neck and shoulder tension, pelvic girdle dysfunction, and low back pain can more easily develop. Your osteopath can diagnose and treat these conditions and get you back to normal enjoying motherhood without the pain or problems. Your newborn's head becomes moulded by its passage through the birth canal. Most moulding usually resolves in 24-48 hours, however in some cases this unmoulding process is incomplete as can be seen in a long or very fast birth or if forceps or ventouse are used. This results in tension in baby's head and body that may cause discomfort and result in conditions such as colic, reflux, flattening of the head, irritability, sleep disturbances, or latching and feeding problems. Osteopaths can feel for distortions in baby's tissues, and gently encourage a return to normal functioning of the involved areas such as the head and neck to help alleviate these conditions. "If I had known during my pregnancy that osteopathy could help, I would have started earlier. At about 15 weeks of pregnancy, I started to get awful back pain and aching in my pelvic joints. I ended up with what my OB called 'the worst case of pelvic arthropathy he'd seen in a long time'. This slowly got worse over the course of the pregnancy and included pubic symphysis pain. Rebecca has worked wonders on aligning my pelvis and I feel less pain and more mobile as time goes by. I would definitely recommend osteopathy to any pregnant woman who is having pelvic issues."